The 2017 Bendigo International Festival of Exploratory Music’s Music Writer’s Workshop for emerging critics was conducted by Matthew Lorenzon and Alistair Noble. You’ll find links to Partial Durations reviews by Joel Roberts, Kishore Minifie Ryan, Lewis Ingham and Simone Maurer in Matthew’s overview of the festival below. The festival began with four of its most virtuosic soloists balancing atop a pile of amplified wooden planks. In Plank Rodeo, Jacob Abela, Matteo Cesari, Jessica Aszodi and Jane Sheldon share each other’s weight, bending and swaying according to a series of performance directions devised by the composer Jenna Lyle. At times, they hold one another as though they are delicate musical instruments; at other times they stomp around the planks, which explode in loud pops and creaks. 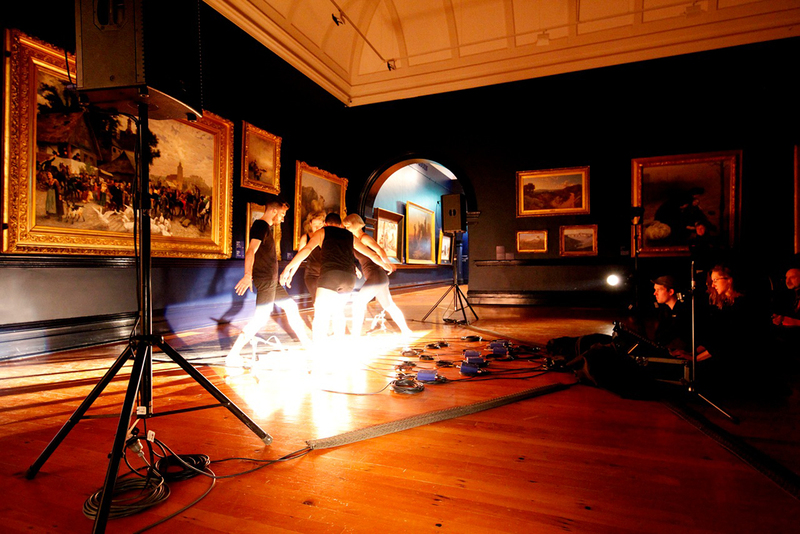 The planks and bodies are echoed in the frames and figurative paintings adorning the walls of the performance space, a small room in the Bendigo Art Gallery. An opening ceremony of sorts, the inextricably linked sounds of bodies and wooden instruments echo out of the room and throughout the gallery’s collections. Already known for her physically demanding performances of contemporary opera and concert music, Aszodi has opened a rich seam of physico-vocal exploration through her partnership with Lyle. Their co-devised work Grafter saw Aszodi and Lyle intertwine into one sound-producing body by muting, resonating and modulating each other’s sounds. Aszodi convened the BIFEM Composer Colloquium around the topic of Author/Agent/Process/Frame, where much was made of the festival’s role in mediating the audience’s experience of such performances. Whereas the BIFEM audience seemed happy to perceive Aszodi and Lyle’s works as primarily musical, this was apparently not necessarily the case in prior showings within visual art and dance contexts. US singer Juliana Snapper and UK composer Andrew Infanti’s underwater opera You who will emerge from the flood continued the theme of vocal exploration. The modular work incorporates video, pre-recorded audio and live singing above and below water (see excerpts from earlier productions). BIFEM got the budget version, which is performed in a dunk tank, but the work can also be performed in a swimming pool with the audience’s ears submerged. The context informs the work so profoundly that I doubt one can really compare the two. Atop the tank in a black dress and with long blonde hair extensions, Snapper cuts a carnivalesque figure. A dunk tank is an instrument of ritual humiliation and frames Snapper as an object of sexualised humiliation. However, she is not dunked, but enters it willingly, lying on the platform and singing just above the water before slipping in as if as an afterthought. As she explores the tank with her voice, a close-up video feed is projected onto two large screens. Snapper forms striking and beautiful tableaux, as when, floating face down, curled in a ball, the hair extensions protruding from between her legs fan out symmetrically. 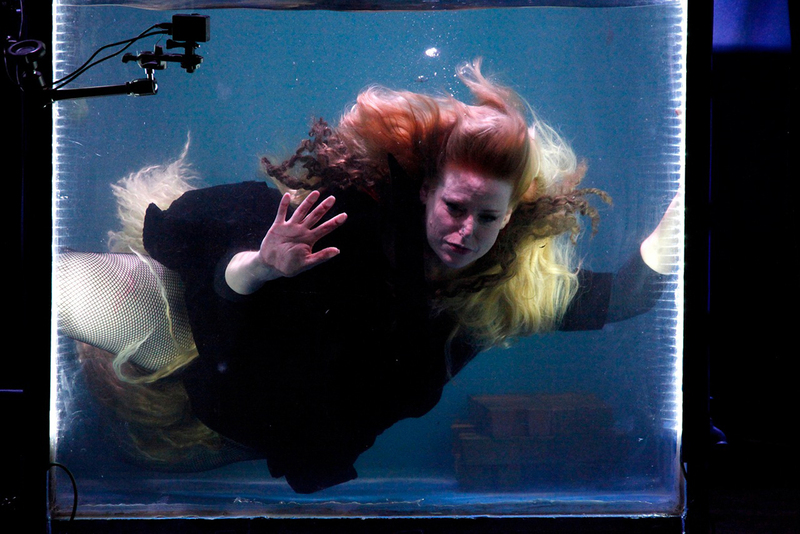 Her movements become gradually more frantic and a video appears of two men repeatedly holding her underwater, letting her rise to the surface briefly to breathe. In the tank the power relationship is more nuanced. She dives to the bottom, holding herself underwater by pressing her foot into the cage above. The audience feel empathy with Snapper, holding its breath as she dives. However powerful the performance as a work of theatre, the phenomenon of underwater singing sounds exactly as you might expect. Strip the stage back to a music stand, four speakers and some atmospheric lighting, and Juliana Snapper is able to sing with her full terrestrial force, accompanied on electronics by Miller Puckette (inventor of the ubiquitous Max/MSP software). Their program provided a panorama of possible interactions between the voice and electronics from the unobtrusive background of Philippe Manoury’s En écho to the fire and brimstone of his Illud Etiam, after which the concert was titled. In a simple but powerful gesture, Snapper lights a match as bells toll at the end of this arcane work. The small flame seems to banish all the water of the previous night. The almost universal appeal of the string quartet makes the Argonaut String Quartet’s program a favourite each year. This year saw the premieres of new works by Samuel Smith and Caterina Turnbull next to works by Clara Iannotta and Anahita Abbasi. I wasn’t sure whether Turnbull’s quartet was animal, vegetable or mineral. Eminulos (a Latin adjective describing a slight projection) was commissioned by Julian Burnside QC, and is a menagerie of bird-like chirps and call-and-response. 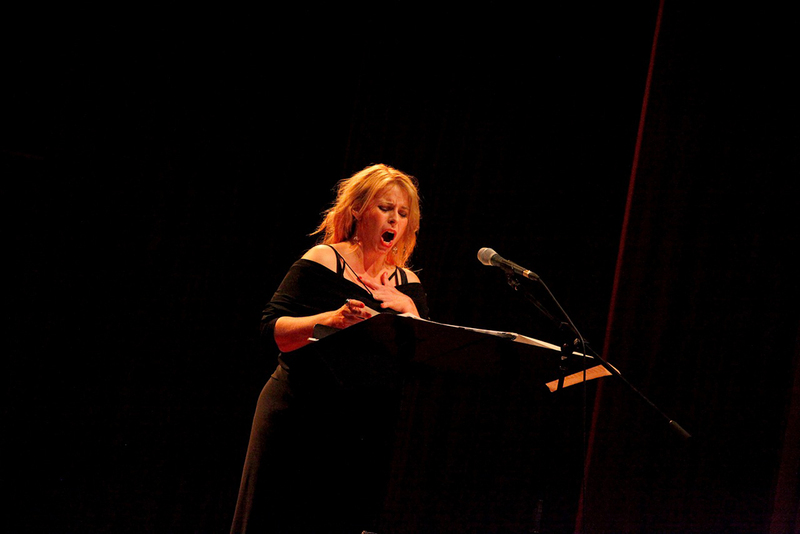 The repeated gestures fork and grow organically between the instruments. On the other hand, the stratification of instrumental effects folding into one another gives the sense of aeons of geological activity. Smith’s BIFEM Box Office Commission, Dead Oceans, is a dense microtonal flow of harmonics, rocketing glissandi and wood-on-string death rattles. Nothing stays still, but the audience catches glimpses of harmonic repose that founder and disappear from sight. While the composer claims the work is only tangentially related to climate change, it is one of the most devastating environmental works of recent years. BIFEM’s coveted solo recital series was back with concerts by Matthew Horsley on uillean pipes, Mauricio Carrasco on classical guitar and Anna Kwiatkowska on violin. The odd one out in this list is clearly Horsley, a proponent of contemporary music for the Irish bagpipes. His performance of Liam Flenady’s A Book of Migrations for electronics and uillean pipes involved the composer wayfinding through Horsley’s own catalogue of almost 200 fingerings on the instrument. The microtonal part is supplemented with electronics and readings in medieval English and Gaelic from the Seamus Heaney poem Buile Shuibhne. Kwiatkowska’s survey of contemporary works for violin by Polish composers was a welcome link between present and past in a festival that focuses on the bleedingly new. This festival saw the Victorian debut of Brisbane’s Kupka’s Piano, the most exciting contemporary music ensemble north of Sydney. Their program included Elliott Gyger’s first thoroughly microtonal work, a double concerto for flutes entitled Fray. So finely managed were the microtones that the piece did not sound very microtonal at all. Instead one was lost in the thoughtful and restrained atmosphere as Gyger carefully worked his way through all the possible permutations of two players and bass flute, alto flute, treble flute and piccolo. 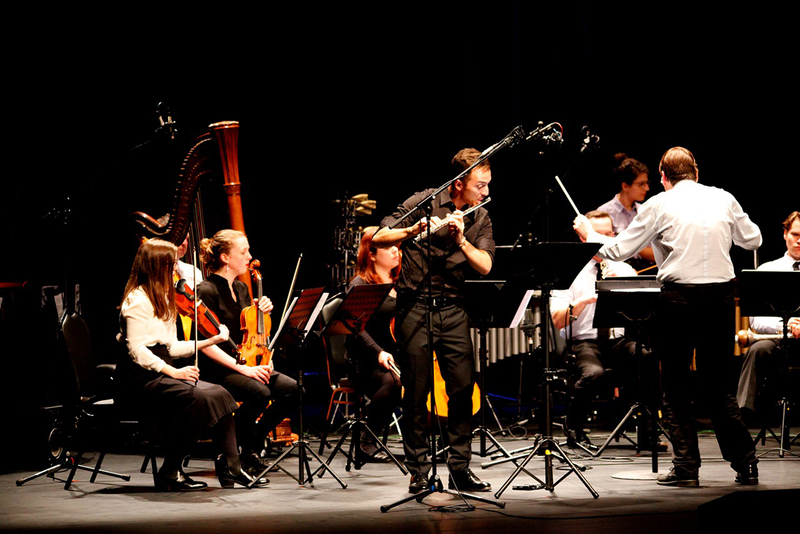 Never a festival to shy away from political or controversial works, BIFEM’s house band The Argonaut Ensemble performed provocative works by the Israeli composer Adam Maor and the Argentinian composer Fernando Garnero. Maor’s BEYROUTH15072006 takes as its inspiration the recorded improvisation of the Lebanese trumpeter Mazen Kerbaj during the bombing of Beirut in 2006. The trumpet is here transformed into the trombone played by Charles MacInnes, which slides anxiously among samples of bombs and car alarms from the original recording. Garnero described Neon Pig as a work “with no historical depth,” but he began the concert with a speech about the disappearance of the indigenous rights activist Santiago Maldonado. It was particularly alarming given he was one of over 30,000 people “disappeared” during the Dirty War of 1974–83. At the end of the oinking and snorting work, Garnero stood up from the electronics desk at the back of the stage and ‘withdrew’ each performer one by one with a grasping hand gesture. Far from a work with no historical depth, in this performance context the work was a warning against ahistoricity. An endless stream of events including the Monash Composers’ Concert, the tape duo Sultan Hagavik, Erkki Veltheim’s late night Ganzfeld Experiment, a concert and forum dedicated to the Australian composer Keith Humble (1927-1995), Miller Puckette’s computer music workshop, a concert for massed clarinets, an electroacoustic listening room, a children’s concert by the percussionist Madi Chwasta, the Music Writers’ Workshop (linked liberally here) and a pre-concert analytical lecture from the Melbourne Music Analysis Summer School (by yours truly) ensured that festival goers were both entertained and exhausted throughout the weekend. This year’s concert program was perhaps most interesting within the context of Australia’s wider contemporary music culture. Despite the privileged place of percussion music in Australia and all the clichés of sports-loving Australians, contemporary performers remain stubbornly glued to their instruments. The occasional scored physical gesture or sprinkle of dramaturgy usually suffices to signal a boundary-breaking work. I don’t think anyone really minds an excellent performance stock-still in front of a music stand, but if you’re going to move you might as well somersault with a partner, jump in a water tank, or make an overt political statement. For reviews of BIFEM 2017 concerts go to Partial Durations.